Just in time for our cold-weather retreat into the kitchen, two Vermont authors have penned two unique cookbooks, each with an eye on the fundamentals.
" 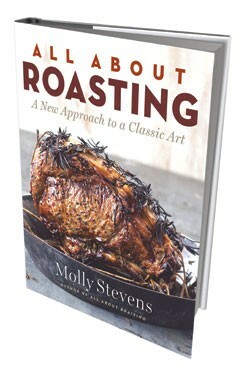 target="_blank">All About Roasting: A New Approach to a Classic Art, coming from W.W. Norton on November 1. After tackling the particulars of braising in her last book, why did she choose roasting? “It’s something that people take for granted. It’s much more nuanced than people understand,” says Stevens, who covers every conceivable morsel from beef to vegetables, fish to fruit. She includes tips on equipment, wine pairings and charts that outline such things as “go-withs” for roasted foods (charmoula with lamb chops, for instance). All About Roasting features 155 color photos. Visually quieter, magazine editor Edward Behr’s The Art of Eating Cookbook: Essential Recipes From the First 25 Years is laden with history and tips on choosing the best ingredients for various European-inspired dishes. The recipe for moules à la marinière, for instance, is preceded by two pages on the history of the dish and what occurs as mussels steam. “It’s meant to provide a foundation. There’s a range of technique, a range of raw materials and also a simplicity,” says St. Johnsbury resident Behr. For 25 years he has woven his love of food history into the pages of The Art of Eating, which he has edited since starting it as a newsletter in 1986. At first, Behr thought he would simply paste some of his meticulously tested recipes — such as ones for charcuterie — into a Word document. But he found himself reengaged, retesting and sometimes tweaking them — and adding the notes, which he believes enhance the meals. “If you have a taste in your mouth devoid of history or culture, there’s no resonance. It’s when you have a sense that Ah, it tastes like spring, or it comes from a particular culture, that there’s a bigger sensual experience,” Behr says.